Why are Elephant Ears so Big and Do Elephants Have Bigger Ears to Hear Better? Big elephant ears are all the better to hear you with my dear. But seriously. 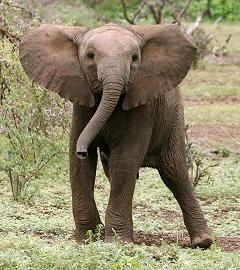 Elephants have big, floppy, oversize ears that can be six and a half feet long and nearly as wide. They have several functions, but helping them hear is not one of them. One is to make the elephant look even bigger when it defends or attacks, as if that were necessary. Another function of the big ears is to wave away flies. But the primary use of the elephant’s big ears is unexpected. It’s to help keep the animal cool in the heat. Because elephants’ ears are thin and rich in blood vessels, heat escapes easily into the air. When elephants wave them around, the blood inside cools by as much as 9 degrees F.
The need for that cooling function is also one of the differentiating features of African versus Asian elephants. African elephants live in a hotter, sunnier climate, and so their ears are bigger. Btw, calling Elephants Dumbo ticks them off. How Intelligent are Elephants and Can Elephants Make Art, Music and Use Tools?